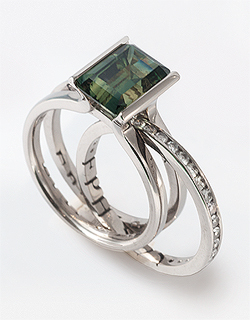 18k white gold, emerald cut green sapphire, white sapphires. Ben commissioned this wedding ring and engagement ring for his beautiful Australian fiancée Kendal. The large green sapphire was mined in The Gemfields - a sapphire mining district in Queensland Australia. The inscription on the inside of the ring is from Ephesians 5, which includes the words "two will become one". In this ring two rings become one, the wedding ring locks in place between the two bands of the green sapphire engagement ring. Beautiful and clever, like so much of your work.